Attend Christ Presbyterian Church in Nashville on a Sunday morning and you’re likely to run into people involved in the church’s Special Needs Ministry. With several Sunday School classes for children and adults with disabilities, and special care during worship services, Christ Pres is meeting the spiritual and practical needs of approximately 20 individuals who have disabilities. The scope of the Special Needs Ministry, however, is much larger. It includes intentionally ministering to the 20 families, addressing the unique needs that each one has. The reach of the ministry extends beyond Sundays. A mom’s support group, “Extreme Moms,” allows the women opportunities for support and community throughout the week. Regular respite events provide opportunities for parents to have a much-needed break from the daily challenges of caring for their family members with disabilities. More on that ministry below. Volunteers aren’t only recruited from among the general church population. Sanders says, “As our kids with special needs grow up, we reach out to their parents and ask if the kids can become helpers in the ministry, too.” The Special Needs Ministry also partners with Christ Presbyterian Academy whose students have been greatly impacted by serving others with disabilities. As the ministry grew, the church recognized the needs of families touched by disability beyond the congregation. In 2006, the church began a new outreach in the community. Special Saturdays was born out of the need for rest and respite for parents of kids with special needs. 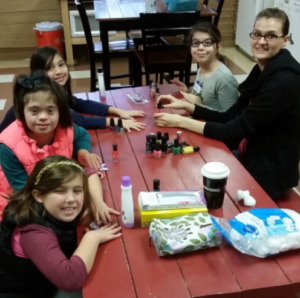 Every second Saturday of the month, about 60 children (including kids with disabilities and their siblings) from 30-35 families spend a day of exciting activities at the church while their parents have a day off to do things they ordinarily can’t do. Christ Pres recently posted a video about Special Saturdays. It describes better than any article could how this outreach is changing lives. If you would like to learn more about the special needs ministry of Christ Presbyterian Church, please email Gigi Sanders at gsanders@christpres.org. Disability ministry, now a very natural part of church body life at Covenant Presbyterian Church in Harrisonburg, Virginia, has come a long way since its beginning in 2000. Almost seventeen years later, Covenant Presbyterian Church’s ministry to individuals with disability numbers approximately 40, including both members and friends from the community. What was originally a few natural steps toward meeting the needs of a few families has grown into a fully developed ministry with its own leadership and volunteers. 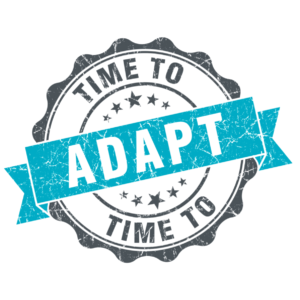 In the fall of 2016, Through the Roof leaders began to contemplate ways to better reach and minister to their families touched by disability. Their desire was not simply to offer ministry activities for individuals who have disabilities, but to get to know them deeply, walk alongside them, and build genuine friendships, while offering support to their caregivers. Coordinators Amy Roy and Sarah Pruett brainstormed on ways to create the ideal ministry setting that would invite the sharing of stories and lives. Their solution? A coffee house. “We wanted parents to be able to enjoy relaxed, genuine conversation; and while they enjoyed coffee and fellowship, our volunteers held a social event for the children with disabilities and their siblings,” said Updike. 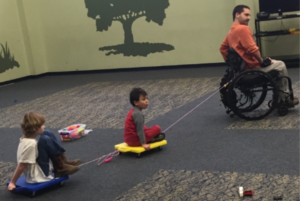 “We were pleased to have about 30 adults attend and were delighted to care for almost 20 children.” Interestingly, among the 50 attendees, there was a wide range of disabilities: physical disabilities, intellectual disability, Down syndrome, autism spectrum disorder, Alzheimer’s, RAD, learning disabilities and ADHD. Through the Roof coordinators set the tone for the meeting by sharing their own stories of learning to live with disability. Following their testimonies, there were discussions at each table, facilitated by members of the Session and the Children’s Ministry team. Tears and laughter were shared as families felt valued and accepted in the midst of their struggles. “There was such freedom in sharing with others who ‘get it.’ Most importantly, we heard the needs of these dear members of the body, and we developed a way to move forward in our ministry,” Lisa reflected. One of our goals at Engaging Disability is to connect churches with each other. We share your stories so that you can be inspired and learn from others who have had experienced success and ministry growth in very authentic and organic ways. Covenant Presbyterian Church in Harrisonburg, Virginia has approximately 900 members. They offer three services each Sunday: two in English and one in Spanish. Worship services have a casual atmosphere, mixed style of worship, and traditional structure, with a strong emphasis on the preaching of the Word. The children’s programs are bursting at the seams as all their kids (English-speaking, Spanish-speaking and Through the Roof kids) participate in all children’s ministry activities together. 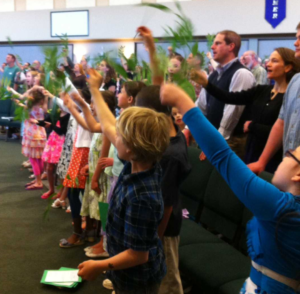 Children in first grade and older join their parents in the Sunday worship services. If you would like to learn more about the disability ministry of Covenant Presbyterian Church, you may contact the Through the Roof co-leaders Sarah Pruett at sarahcpruett@gmail.com and Amy Roy at amykroy@gmail.com.